"Deviled ham puts the Deviled into Deviled eggs." Place eggs in a saucepan and cover with cold water. Bring water to a boil and immediately remove from heat. Cover and let eggs stand in hot water for 10 to 12 minutes. Remove from hot water, and run under cold water to cool. Peel eggs, and cut into halves lengthwise. Carefully remove the yolks from the eggs, and place them into a medium bowl, scooping out a little bit of the white along with the yolk to make a more generous cup for filling. Mash the egg yolks with deviled ham, relish and enough mayonnaise to make a smooth mixture. Season with salt and pepper to taste. Spoon the mixture into the egg whites, or pipe with a piping bag for a more elegant look. Garnish filling with a sprinkle of paprika, and top some of them with a slice of green olive stuffed with pimento. Chill until serving. A delicious deviled egg recipe gets a cute-for-Easter makeover. These eggs are SO good. They add nice new twist to ordinary eggs. I added a touch of mustard to the yolk mixture to give it a little zip. This recipe is definately a keeper!! Thanks!! We did not care for the deviled ham in this recipe. I guess we are just too hung up on 'regular' deviled eggs. I am from the south born and raised..these are nothing like i remember...not so great....thanks though.. I made these for our get together at work, and we loved them, they will be on our table for Thanksgiving. Thank you for sharing. 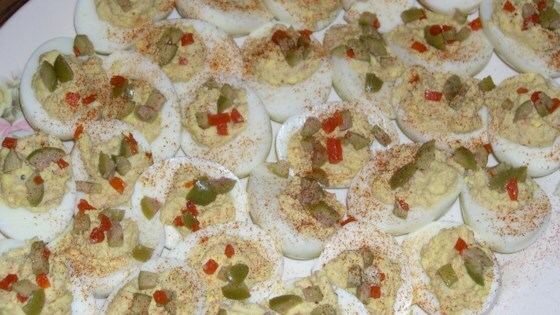 I've been making deviled eggs this way for years, minus the pickles and olives. Usually add a bit of minced onion. Every time my house church has a picnic, this is everyone's first request.